Despite Delhi Police’s refusal to grant permission to hold the ‘Yuva Hunkar Rally’ in Delhi, Gujarat MLA Jignesh Mevani, who has been accused of instigating riots, freelance protestor Shehla Rashid and others have defied police orders to conduct the rally. 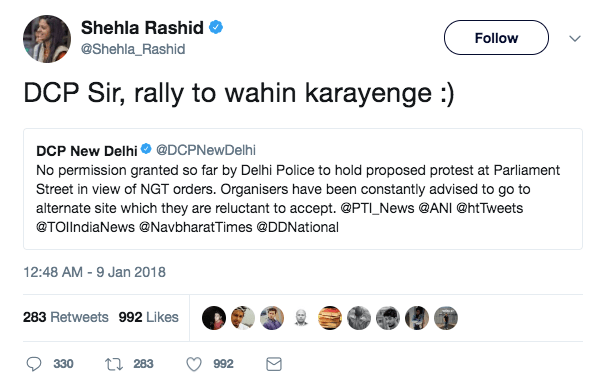 Despite Delhi Police’s explicit refusal to grant permission to hold the rally, the Shehla Rashid and gang are blatantly lying on social media of having granted the permission. Organisers of tomorrow’s #YuvaRally met high ranking officers in the Delhi Police for the second time this week (just now), and Police again gave a clear go ahead, like before. Now the question is, why was media running fake news of cancellation all day? ? Oh, wait! The ‘social justice’ rally is allegedly being held to demand release of Dalit outfit Bhim Army, Chandrashekhar Azad, who was arrested last year in June for being the main accused in Thakur-Dalit clash in Himachal Pradesh. The Delhi Police, however, has clearly denied permission for the rally to be held. The Police says that they have offered an alternate venue for the rally, but the organisers were reluctant to go there, reasons of which are not known. Despite the clear statement by Delhi Police, Shehla Rashid, arrogantly said that the rally will be conducted at Parliament Street only. She had once claimed that since she is a Muslim, she doesn’t lie even though she has a history of lying and today, she has been caught lying yet again. What stands out is, how confused the entire gang looks, swinging between “we have permission” and “it’s wrong to not give us permission”. Earlier, Prashant Bhushan had quoted a tweet by Shehla that said that they had met the Delhi Police twice and they had got clear permission to go ahead with the rally, and that the media was running “fake news” by saying that no permission was granted for the “Yuva Rally”. Funnily enough, today after Delhi Police clarified that Shehla and gang were perhaps lying and no permission was granted to them for the rally, Prashant himself changed goalposts and said that “it would be undemocratic” of the police to stop the gang from protesting which is their “fundamental right”. One wonders, if indeed the Delhi Police had granted permission, why has Shehla, Bhushan or anyone of their comrades not produced any evidence to back their claim. In fact, as if in sync, they have all changed their line of argument to the usual “this is my right, police can’t stop us”, instead of saying “Delhi police is backtracking after giving permission”, which further raises the suspicion if any permission was granted in the first place. The central issue here seems to be not only the blatant defiance of police orders, but also the lies that surrounded this rally. These career protesters have not been able to prove that the Delhi police granted permission, and now, the usual cacophony of “state is trampling our fundamental rights” has gathered momentum to distract people from the fact that the demonstration seems to be going ahead without police permission. Shehla however, is not new to such shenanigans. 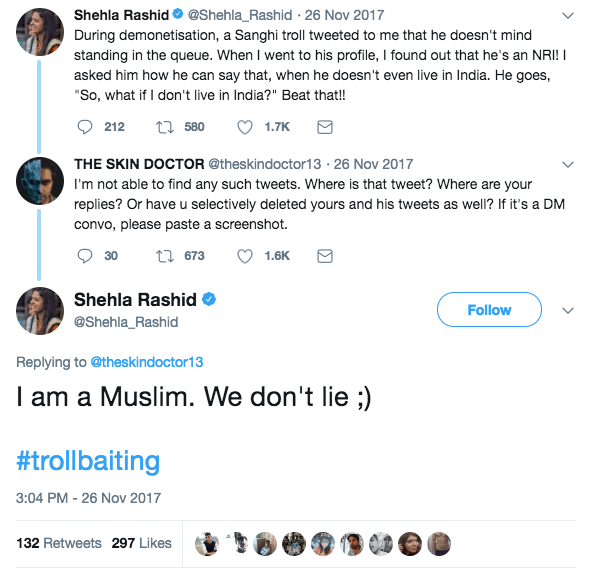 Earlier Shehla had no proof for a tweet she claimed was tweeted to her during demonetisation. She has also lied and accused JNU administration of restricting student access to ‘filtered’ content from YouTube. JNU administration, headed by RSS man @mamidala90, has censored JNU WiFi. Students can’t access content from AIB, The Wire, NDTV, YouTube videos related to student movements. Keyword search related to Mamata Bannerjee, Rahul Gandhi, Shehla Rashid, Kejriwal, Kanhaiya censored!!! Through this entire fiasco, none of them are claiming that the Delhi Police has backed off from granting the permission. Once their lies were caught, the gang started claiming that police can’t deny permission. While it is interesting to note how these elements have indicted themselves in the tangled web of lies, it is also worrying how police orders are being defied blatantly with scant regard for law and order. As the talks of a coalition with Congress failed, AAP is going to be contesting on all the 7 seats of Delhi. Atishi of the Arvind Kejriwal led Aam Aami Party, who had earlier changed her name to 'Singh' is back to being 'Atishi Marlena' in her 2019 election affidavit.